So… just gonna start this week’s post out with a bang! A Tofu Tail has been selected as one of the 25 games to exhibit at the Seattle Indies Expo on Sunday, Aug 30! SIX is an event that takes place on the Sunday during PAX Prime, showcasing 25 indie games for everyone to see! Brolley and Andy will be showing off A Tofu Tail at the event with a bunch of other awesome indies – so if you are going to be in Seattle for PAX Prime or anything in general on August 30th, stop in and check out all of the awesomeness! It takes place at Melrose Market Studios (a six minute walk from PAX) from 9am to 6pm. Be there! We will be pulling together our freshest demo build with most of the game completed sitting right next to our fancy banners and stuff! By this time we should also have pre-orders for A Tofu Tail open, some merchandise, the A Tofu Tail official trailer and website launched, etc… Sooooo much to do – but all exciting! 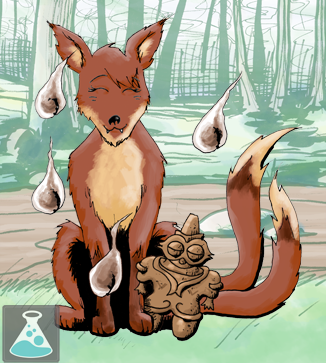 We also put up a new character page: the headstrong Earth Kitsune! Over the next weeks we will be posting new songs from the A Tofu Tail soundtrack as well as putting up the newest coding changes to the game. Of course there will be new upcoming art and metaverse posts as well!